This schematic covers the complete version 1 Rainbow E2 Type 12 Black series face plate assembly that includes the water pan neck, shroud, and springs. This DOES NOT cover the LED version that has a red diagnostic light on the face plate. Effective serial number 20200001 with a start date of March 10th 2011 through serial number 20440999 (rough estimate) and an end date of September 2012 (estimate). Face plate assembly for the early version e2 Black (E2 Type 12) Rainbow system. This item does NOT have the red LED light. The LED version did not come out until late 2012. Please confirm if you have a red LED light on this face plate before you order. 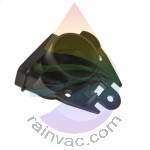 Water shroud power nozzle receptacle door for the e2 Black (E2 Type 12) Rainbow system. This door helps keep water and debris out from the power nozzle receptacle. Water shroud door spring for the E2 Type 12 (e2 Black, Silver, Gold), and E-2 (e SERIES™) version Rainbow systems. 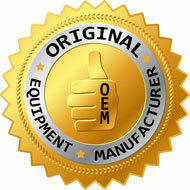 Water pan neck for all E2 Type 12 and E-2 (e SERIES™) Rainbow models effective serial number 9280000. Stripped faceplate for the e2 Black (E2 Type 12) Rainbow system. The will not accept the version that has the LED light and is the face plate only without receptacle and other items that attach to this part.